On October 30th, 2012, No Margin, No Mission™ conducted it’s highly popular half-day workshop, entitled Earned Income: Generating Margin to Grow the Mission of Nonprofits in Miami-Dade, for a capacity crowd of nearly 80 nonprofit and foundation leaders from more than 40 organizations in the greater Miami, Florida area. 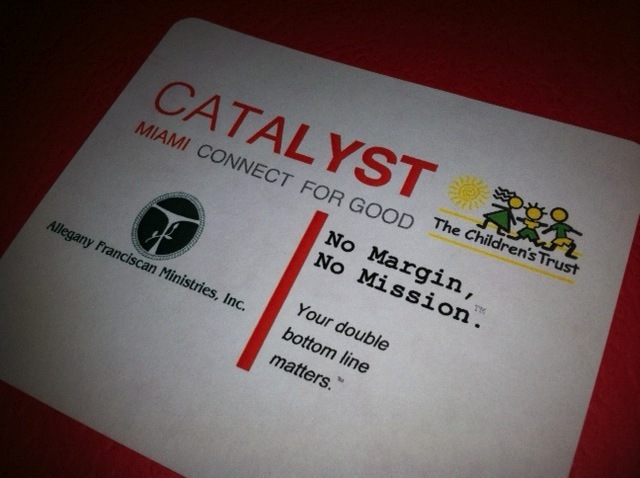 Thanks to generous support from Allegany Franciscan Ministries, Catalyst Miami, and The Children’s Trust, entrepreneurial leaders from the community gathered to explore the basics of earned income, identify potential revenue streams, and begin to plan for margin & mission growth. According to participant evaluation data from the workshop, it was one of the highest rated trainings for such an event. In particular, nearly 100% of the attendees found the session to be (1) highly engaging and interactive; and (2) both useful and actionable. To see what participants had to say firsthand, you can view highlights from the session on this brief VIDEO CLIP that was created by Catalyst Miami. You can also view a summary of the workshop outcomes by taking a look at the one-page INFOGRAPHIC that was also created by Catalyst Miami! If you’re interested in learning more about No Margin, No Mission’s™ Earned Income Workshop, or any of our other unique training, planning, speaking, or implementation offerings, please contact us at info@NoMarginNoMission.org.